Pilot automatically locates on tube or pipe I.D. 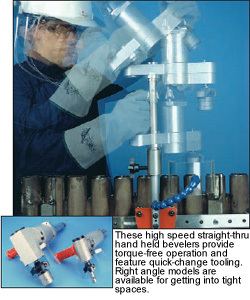 The straight-thru models can machine any degree of bevel on heavy and thin wall tubes, as well as tangent tubes. The most powerful pneumatic high speed end prep tools available anywhere, they can be used by hand or with the EscoTrack mount panel replacement system by using the optional Track Chassis and Post Assembly. With this option, these tools make fast work out of repetitive end preps and cut hours and even days off of boiler tube panel replacement outages. When you need to get into a “œDutchman” of less than six inches, our right angle models do the job better than ever. The HHB-5000 RA or HHB-10000 RA end prep tools are every bit as rugged as our straight-thru models, and are ideal for single boiler tube repairs. All of these hand held bevelers feature quick-change tooling and the automatic pilot system that locates itself on the tube I.D. These high speed bevelers feature the EscoPilot locating system which eliminates the need for clamping and special operator training. Unlike conventional end prep tools that require clamping to the tube or pipe I.D., these tools locate themselves automatically and there are no loose parts that can fall down the tube and waste your time. Simple to operate, just insert the pilot into the tube I.D., squeeze the throttle and finish your end prep completely in as fast as 3 seconds! Part No. Cutterheads, 37-1/2 deg.